STJ FCU members can purchase Share Certificates with many different maturity dates. This credit union is federally insured by the National Credit Union Administration. STJ FCU is also audited and evaluated periodically by the NCUA. 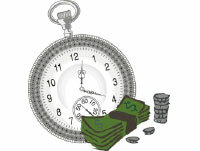 If the length of the Certificate is 1 year or less – Penalty is 90 days of dividends on the principal amount withdrawn. If the length of the Certificate is over 1 year – Penalty is 180 days of dividends on the principal amount withdrawn. View "Rates" for current information or visit a branch office for personalized attention.